Since the 2004 Orange Revolution in Ukraine, civil society has been losing ground, largely without its knowledge, in its ability to effectively organize and mount a non-violent civil resistance movement against corrupt and authoritarian regimes. Its recent government, like many throughout the world, had overwhelmingly gained the power advantage in controlling and monitoring communication through the proliferation and acquisition of tools of electronic oppression. "What makes this invasion of privacy so insidious, is that the public is largely unaware that their communications are insecure...until it’s too late." In 2004, Ukrainian protestors were armed with cell phones and the Internet. Text messages allowed protestors to quickly share information, organize shifts in the main square, and maintain a consistent protest strategy — rapid and widespread communication was one of their greatest advantages. In 2014, those same tools were being used to intimidate and harass Ukrainian citizens protesting in the same square where the Orange Revolution once succeeded. Nearly nine years ago, the world watched a sea of orange fill Independence Square in Kiev as protestors rejected the rigged presidential run-off that brought Viktor Yanukovych to power. The 2004 Orange Revolution was the beginning of a new era of non-violent civil resistance as Ukraine’s popular protests coincided with the expansion of Internet access and cell phone use around the world. Ukraine’s Orange Revolution was the first time in history that the people had gained an unprecedented advantage over the state in a popular protest as the direct result of their access to and utilization of cell phones and the Internet. Following the success of the Orange Revolution, the democratic West speculated excitedly and widely about the potential of cell phones and the Internet to empower repressed people around the world to challenge authoritarian and corrupt regimes. But all the while, governments were watching and quietly preparing new, counter-revolutionary strategies to control communication through mass surveillance and other intrusive monitoring techniques. This was the last time that the people would have such an overwhelming communication advantage in a popular protest. Access to private and secure communication is one of the most critical components to a successful non-violent civil resistance movement. Without it, the stakes are infinitely higher for individuals to voice protest activities. Furthermore, a lack of private and secure communication during a protest already underway can result in miscommunication that can lead to a breakdown in trust between protestors and organizers. A lack of trust can lead to disorganization and confusion, confusion begets chaos, and chaos creates opportunity for violence. Without private and secure communication, a protest that requires strict discipline and impeccable organization will fail to achieve its intended goal. The Orwellian text message that appeared on protestors’ cell phones in January 2014 in Ukraine reading, “Dear subscriber, you are registered as a participant in a mass disturbance,” reveals just how much has changed for protestors since 2004. There is no private or secure communication in Kiev’s Independence Square. It is now readily apparent that the Ukrainian government has the advantage in these protests. 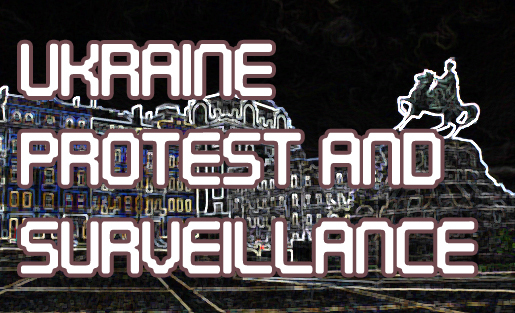 Prior to these protests, the Ukrainian government, just like many governments around the world, had the ability to identify the physical location of anyone carrying a cell phone with a SIM card registered on that country’s cell networks. But when a government chooses to use such information to instill fear in its people and quell a protest through intimidation, it identifies a clear need for citizens around the world to have access and training to tools and strategies that allow them to communicate freely and to protect their privacy. Internet circumvention and anonymity tools have not yet reached the point that they are widely distributed and easily accessed by average citizens engaged in non-violent civil resistance or who simply wish to protect their privacy. There are some solutions that can limit the ability of the authorities to monitor the location of individuals participating in the protests and send them intimidating text messages. But right now, they are imperfect solutions and often difficult or complicated to use for someone without adequate training—and even then, they don’t always work as they should. There are passionate and dedicated developers and Internet freedom and privacy activists working to create the tools civil society needs to allow them access to private and secure communication, but they need more support, and funding to create the tools that largely mitigate the threat of government surveillance. The text messages that were popping up on cell phones in Kiev demonstrate just how essential privacy and anonymity tools are to protecting the freedom to organize, free speech and human rights around the world. Mass surveillance, whether via a government accessing national cell phone networks or using technologies like FinSpy, is the single greatest threat to the advancement of democracy and the protection of human rights across the globe today. What makes this invasion of privacy so insidious, is that the public is largely unaware that their communications are insecure or that their personal information including their physical location is so accessible by their government until it’s too late. Popular protests like that happening in Ukraine today will continue. But when the people are deprived of access to private communication, the stakes of organizing and protesting are significantly and unacceptably higher. Democracy depends on privacy, and privacy depends on democracy to protect it. The events in Ukraine should be a call to action for Western governments to empower citizens at home and around the world to preserve and protect their privacy. The views expressed in this article are solely those of the author and may not reflect those of the Arzuw Foundation. Sarah Lange is the Executive Director of the Arzuw Foundation, a non-profit organization dedicated to supporting the next generation of leaders in Turkmenistan. Sarah is a former Fulbright Fellow to Kazakhstan and has been working and conducting research in Central Asia since 2006. She holds a BA from Tufts University in International Relations and Russian language and an MA in International Affairs from the Fletcher School. Her forthcoming publication in the Fletcher Forum of World Affairs, “The End of Social Media Revolutions,” focuses on the impact of mass surveillance on non-violent civil resistance in authoritarian regimes. This is a thought provoking and timely article. Not just for the Ukraine protestors but for every citizen that carries a smartphone. We live in a revolutionary time and a potentially dangerous one. We must never trust blindly any govt. But always be sure that counter measures are in place as Ms. Lange so aptly states. I would like to hear more on this topic and see it become part of our national and international dialogue on human rights. Governments must respect, protect and fulfill their human rights obligations. Respect means that government should refrain from interfering with enjoyment of human rights (which is also called “negative obligation”of state). Protect human rights applies to the state’s “positive obligation” which requires states to protect individuals and groups against human rights abuses by states or third parties (corporations and multinationals), and finally the notion fulfill means that states should contribute to the enjoyment of human rights. Every civil society, must be able to protest against the abusive governments and third parties, of which Ukraine can be a good example. Thank you for this article. Indeed, we need to be careful in the era of smartphones and governments that can spy their citizens. Privacy of our communications and data depends from person to person. Some people are really fine and they believe they have nothing to hide, that is why they remain very neutral to government’s interference. However, there should be balance in everything. Governments should not use their position to suppress public opinion/ expression/ protest (like it happened in Ukraine).